Treasurer David Cox emailed a summary of the treasury to the officers after the meeting. Prior to the meeting, there was $408.29 in the treasury. After the meeting, upon some member renewals, there is $428.29 in the treasury. 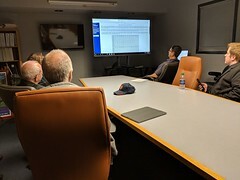 The meeting was held at the Jackson International Airport and consisted of a tour of the control tower and the radar room, as well as a question and answer session. Jim Burleigh, the airport tower manager, and another tower employee conducted a discussion of airport operations to the group. 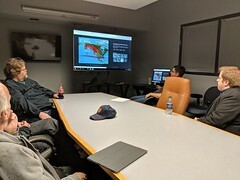 Jim showed the airspace that Jackson controls and discussed the different airports around the region. He discussed that Jackson has a tower, which controls about 5 miles around the airport, runways and touch-and-goes done by the military. They also have a terminal radar approach control (TRACON) which is roughly 30 miles around the airport. They also control 10,000 feet in the vertical. A shift will swap between the radar room and the tower so that they keep fresh. Employees work for the FAA and have to retire by the last day of the month of their 56th birthday. You also cannot be hired if you are older than 31, and can retire with 21 years in. Seventeen years is the average working career of an air traffic controller. Jackson International Airport is a great airport to train at and move onto bigger airports. After graduation, you get to pick where to go based on a list of openings and your placement in your graduating class. Part of graduating is taking a test to make sure you can see in 3D and be able to direct aircraft horizontally and vertically. Jackson is an IFR tower whereas Hawkins is a VFR tower, as well as a contract tower (controllers do not work for the FAA). Jackson would be a slow airport if it just relied on commercial flights and general aviation. There is a lot of military training done there along with the Air National Guard base. The work schedule can be the hardest part of the job, though the tower is closed at night. During a week they work two nights and 3 days. Weather is also very challenging and air traffic controllers don’t like surprises, which often happens with the weather. During Katrina, there was so much wind they turned the radar off and let it spin freely, especially since there weren’t too many airplanes landing or taking off anyway. 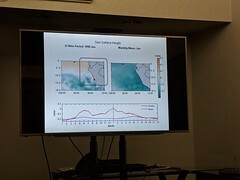 Jim also spoke about the upgrade to their radar and computer systems that will occur in July 2018. He also spoke about Memphis being the busiest airport at 2am due to FedEx and that Jackson was the original location for their facility but the Jackson City Council didn’t want them here. The group then split up and visited the tower and the radar room. Jim fielded questions during this time. After each group was done with the tour, the meeting ended. The meeting concluded at 8:15 pm, and it was adjourned. 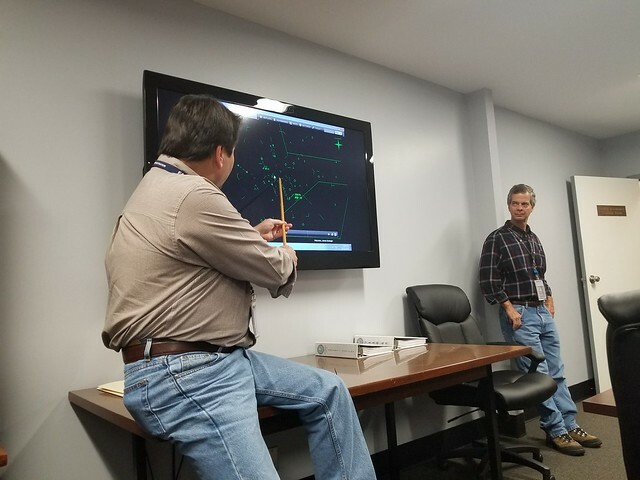 Jim Burleigh of the Jackson airport explains aircraft tracking to the group.